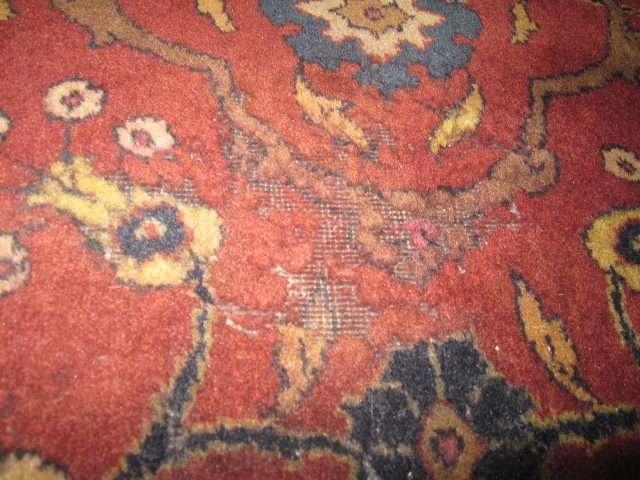 Moth damage is probably the main culprit ahead of damp, water and pet damage to hand-knotted Persian & Oriental rugs in the UK. When rugs are stored in lofts, basements and garages, under heavy furniture or in rarely used rooms, moths use the opportunity to lay eggs which turn to larvae and can be devastating to precious handmade carpets. The larvae eat the wool and if un-treated can quickly devour large sections of pile. Little-Persia are able to treat moth infestations and then carry out restoration work to repair any damage formed by these winged critters. We regularly deal with moth damage from our Glasgow gallery. This work is highly skilled but may not cost as much as you would think, particularly if the foundation is still in place. Of course how fine the rug is, the complexity of pattern and number of colours will all influence the cost of repair. The first stage to the repair of moth damage is to kills the moths (and subsequent larvae and eggs) that are infesting the rug. The quicker this is done the better, we will do this if your rug is in for cleaning or repair but you may wish to stem the issue at home yourself. For this we offer specialised German moth products in the form of a moth spray which kills the moths, larvae and eggs and a moth trap which uses pheromones to attract the adult male moths which are then trapped meaning they can no longer mate, this also helps to keep track of moth movements in a living space.